Telemarkeast.com • View topic - Meidjo - Installation Pics, further testing review. Meidjo - Installation Pics, further testing review. Temps getting colder in the mountains this week has me getting gear ready for the season. I splurged on a new TTS setup, my first new tele setup in many years and wonder if anyone has any experience, hints, tips with the bindings. The Meidjo is the first binding that convinced me it is worth it to move on from Switchbacks and EnerGs, hope I'm not disappointed. 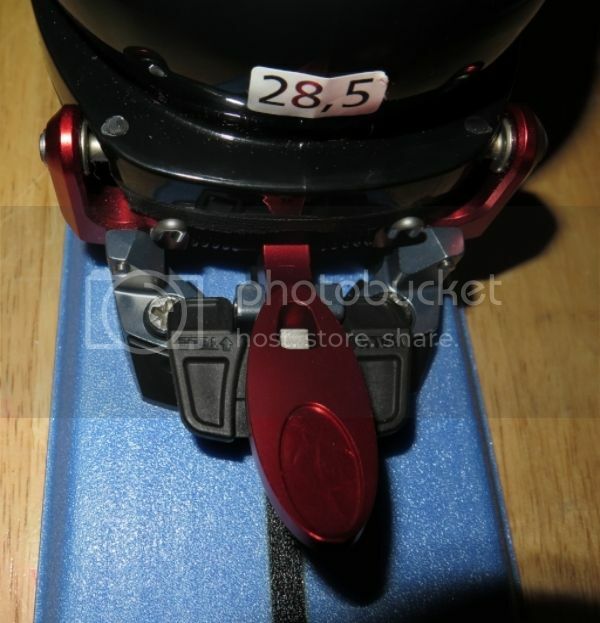 I got a pair of Meidjo bindings coming which I will mount on Surface Live Frees and Scarpa TX Pros. 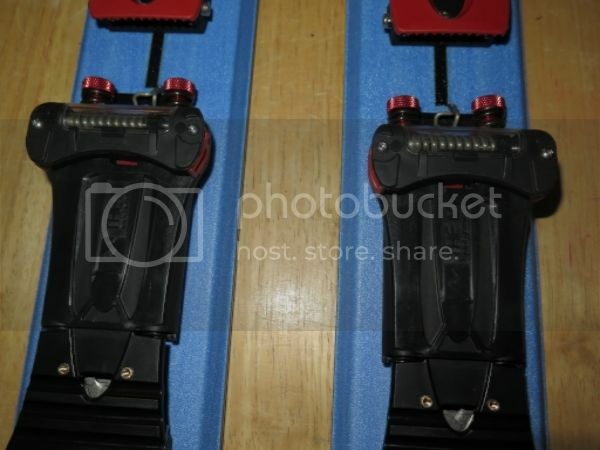 I plan on mounting the bindings with inserts so I can swap onto a pair of Vectors also. Any early adopter reviews? I'll post the mounted setup and my own impressions once I get some days on it. So what is not to like about a completely free pivot tech binding that weighs a pound per foot? Last edited by freedan on Fri Jan 01, 2016 11:17 pm, edited 3 times in total. Re: Meidjo, early adopter input? freedan wrote: Temps getting colder in the mountains this week has me getting gear ready for the season. I splurged on a new TTS setup, my first new tele setup in many years and wonder if anyone has any experience, hints, tips with the bindings. The Meidjo is the first binding that convinced me it is worth it to move on from Switchbacks and EnerGs, hope I'm not disappointed. Got bindings delivered yesterday. Amazingly fast, 4 days from shipping from M-Equipment in France once paypal payment cleared. You can purchase directly from their website, just use paypal as the payment option as it is easier than trying to use a credit card internationally. Bindings look very well put together and finished. The detailed mounting instruction that come with the bindings are translated well with only a few awkward translations that don't get in the way of understanding directions and comes with two very detailed mounting templates. The hardware also comes with two additional springs that can be added to the springs to increase activeness of the binding. 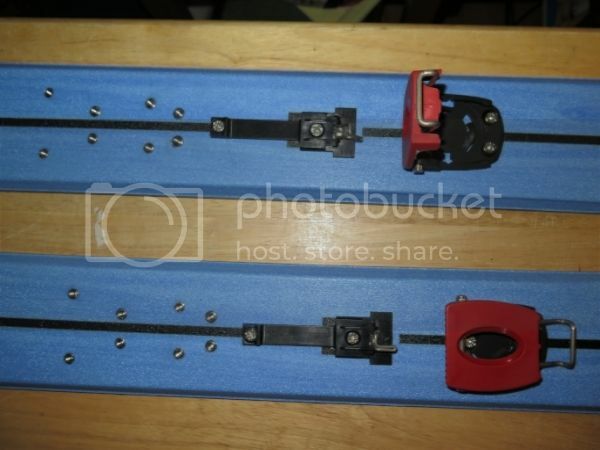 These bindings take 13 holes to mount on each ski! 4 holes for toepiece, 4 holes for tour latch mechanism, 2 holes for tour latch itself and 3 holes for the heel piece. 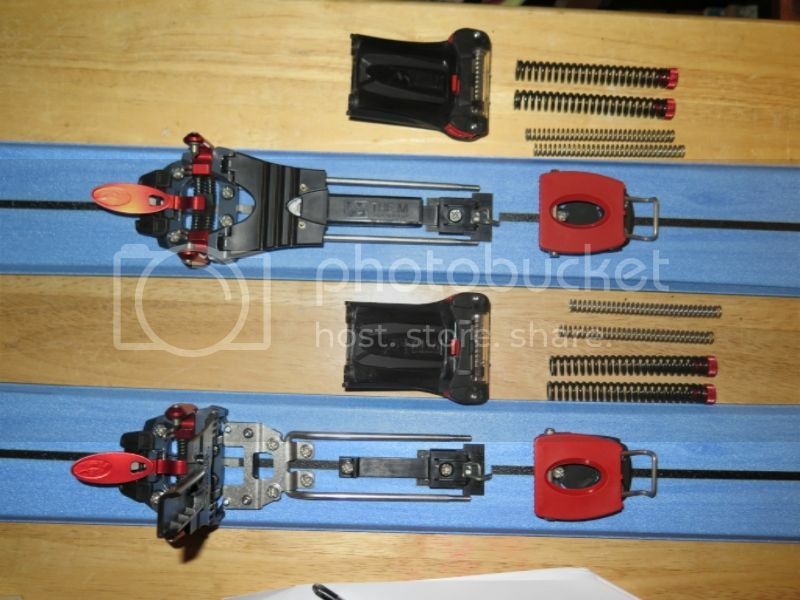 I'm waiting for hardware from Binding Freedom to mount inserts and will post pictures of the finished mount. Pretty slick looking binding, can't wait to try. Just saw the binding on the web. looks well machined. was confused with the NTN and tech fittings at first on the boot. there are no days of bad skiing. only days I ski badly. Vectors + Meidjo bindings < 9lbs. Looking forward to touring on them with the TX Pros. I'm going to mount a set of inserts in the Surfaces and will swap binding as conditions and use warrant and will report on performance of the bindings as I get time on them. 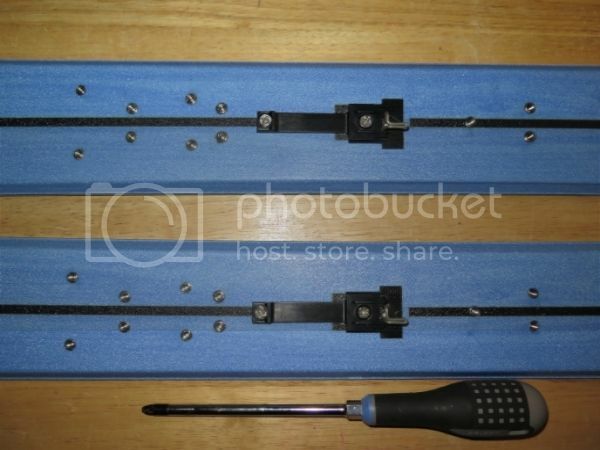 I'll post a few observations too that may help others who install this binding. - Directions are easy enough to follow even with a few awkward French to English translations. The pictures in the photocopied directions could be clearer to be of more use. - They include the second springs to make binding more active. Nice not to have to order the second springs and that they are included. - The mounting template is very sticky and once you apply it to the ski, you aren't likely to get it back off in any shape to use it again. Also, it isn't easy to move it to make adjustments to the alignment of the template. I made copies of the template on clear transparencies that I can tape down and drill through. 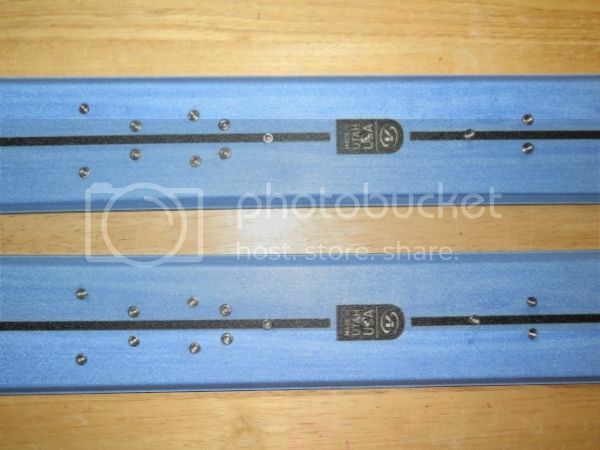 - The mounting template doesn't have the mounting holes for the reinforced headband bracket on it. Not hard to measure and mark but would be nice if all holes that needed to be drilled were on template (the original 11 hole pattern is on the template, the reinforced headband bracket was added bringing it to a 13 hole pattern. - 4x18mm Pozi-Smallhead M5 on tech toepiece. - 2x16mm Pozi- Lowhead M5 on reinforced headband plate. - 2x12mm Pozi- Smallhead M5 on reinforced plate. - 2x12mm Pozi- Smallhead M5 on touring latch assembly. - 3x12mm Pozi- Smallhead M5 on heelpiece assembly. **directions call for 11.5mm hardware everywhere 12mm hardware is used without any problems of bottoming out the insert. Bench testing, it is very easy to step into this binding. There is immediate resistance as soon as the boot comes off the ski. I can imagine it would be difficult to get low. I don't think these bindings lend themselves to knee to the ski style but will favor a more upright stance. Zero resistance free pivot with huge ROM and the ability to leave all the weight of the binding latched to the ski will make for as easy as it gets skinning. Nice pictorial, thanks. 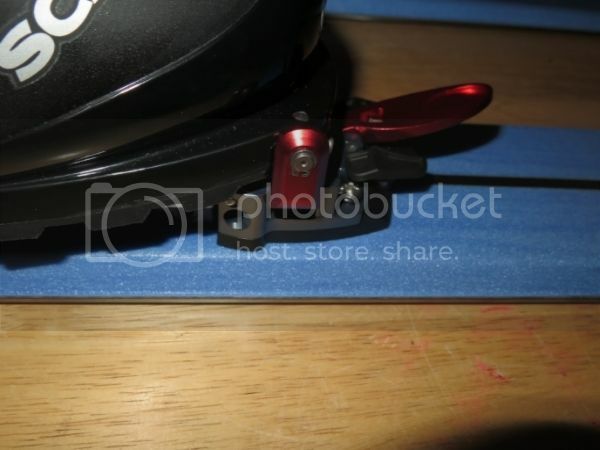 Did you weigh the bindings themselves? And can you play with the spring tension to soften them, or is your description based on already low tension? And it's hard to imagine swapping those bindings to another ski when you have to go through 26 screws. No, I didn't weigh them but will just going off the stated weights. Actually, it is really easy to swap the binding with hardware that is #3 Posidrive from Binding Freedom vs. hardware that takes an allen wrench. I have taken the binding off and put them back on in 10 minutes now I know what I'm doing. Definitely a few steps involved though. You can adjust spring tension quite a bit. Even with the springs hardly loaded there is immediate engagement of the binding. The red knobs at the end of the springs can be used to tighten them down and a second set of springs is included that fits inside the first set to provide even more resistance. Independent of the springs for binding retention is the release mechanism contained in the clear window of the second heel. These springs are adjusted via a 3mm allen wrench to set the release. The second heel can twist out of the red tabs on either side of the second heel. I'll post a video of "arming" the binding to ready it for step in and also how the binding is put into tour mode and the second heel is latched to the ski. Just curious, how much work/dissasembly of the binding will it be to swap between skis? seb wrote: Just curious, how much work/dissasembly of the binding will it be to swap between skis? Besides removing the various #3 posidrive screws (really easy with the appropriate driver), you need to unscrew and remove two springs per binding which allows you to slide the plate and second heel assembly off the threaded rods (a pretty simple process) to allow access to the screws for the headband assembly and the reinforcing plate. Once you have done it a few times and understand how the binding works, removal with inserts and disassembly of the binding itself is pretty simple. I can swap both bindings between skis in about 10-15 minutes. Installing inserts was a bit of a leap of faith with that many holes to drill but it has worked out well. Probably actually ski them in the next week or so. Sounds great. Thanks for the feedback! This is the first binding that tempts me at making the switch from 75mm so I'll be looking forward to hearing more. Conditions: 1st day deep, light unconsolidated powder; 2nd day settled and denser powder. Touring: Both days I set the skinpath and the tech toe in free pivot makes skinning as easy as can be. It is barely perceptible but they tour even better than Switchbacks, probably from the ability to leave all the binding weight on the ski and the TX Pros being lighter than the EnerGs I'm used to. I had no problem getting into or out of tour mode. It is necessary to take skis off to put the binding into tour but unless you are a rando racer who puts their skins on while the ski is still attached this shouldn't be a big issue (I was able to put them into tour with the ski still on with a little practice but I'm not a fan of the yoga with sticky skins required to skin up with skis still attached). No problems getting into tech fittings even when they were packed with snow. Switching from tour to skiing at the top is as easy as releasing the plate from the ski and stepping the duckbutt into it and stripping skins - no ski removal necessary. I'm still dialing in the weighting for tele turns, they certainly are plenty active for someone coming from Switchbacks (but I used to ski HH#5 for a number of years). I don't know if it is me coming from a more neutral binding or if the dynamics of weighting is slightly different but I have no doubt they will shred - I just need a day on the groomers to get the feel of them. They engage as soon as the foot begins to lift. In deep snow I had no issues parallel or tele, can't give any feedback on hardpack or anything groomed since everything I skied was fresh tracks. I set them up with the springs at 3 out of 5 and the release set half way. I didn't have any issues of pre-release and did release once in a slow speed fall when my tips got caught in a tuft of grass under the snow. It wouldn't have been an issue if I didn't have the release but was reassuring that I could feel my heel twist out. The step in feature of the binding is great, but you need to stomp down a place to get into your skis in such deep powder. On a cable binding with a heel throw this isn't such an issue. I didn't have any issues other than the attachment point for the duckbutt would get packed with snow and Ice while skinning sometimes and I would have to clear it to get the boot to fully click in. The heelpiece and touring riser are a weak point in the design. You have to make sure it is screwed tightly to the ski to get it to really pop up and have any chance of staying. The risers are prone to collapsing. Getting out of the binding is as easy as depressing the tab in front of the tech toe and stepping out. Overall, I'm very happy with the binding and has been what I hoped for. The only unknown is durability and since I haven't met a tele binding that I didn't eventually break, I'll see how this compares. I'll post more impressions as I ski them more on piste. I'll probably be adding the second set of springs and dialing up the release. Re: Meidjo - Installation Pics, further testing review. I got to really put the binding to the test on a trip to Colorado. I skied powder, chalky hardpack, in alpine bowls and tree runs. The binding impresses me. I didn't have a single prerelease in days of hard skiing. I was skiing cold, dry conditions and had a couple minor hassles clearing ice so I could arm the step in for the ntn heel. No problem ripping turns with these bindings. I didencounter the uphill ski chatter while tele turning. It seemed to go away as i really got the weighting down. There is definitely a bit of an adjustment in the way they feel weighted underfoot in the tele turn. So far, so good with one caveat, the heel assembly is stone age design compared with the sophisticated design of the toepiece.